This is straightforward, simple, and serious comfort food. I had some leftover rotisserie chicken that I needed to use. I took part of a bag of frozen mixed vegetables and put it in a saucepan along with water and Penzeys Brady Street seasoning. I turned on the heat and added the chicken. 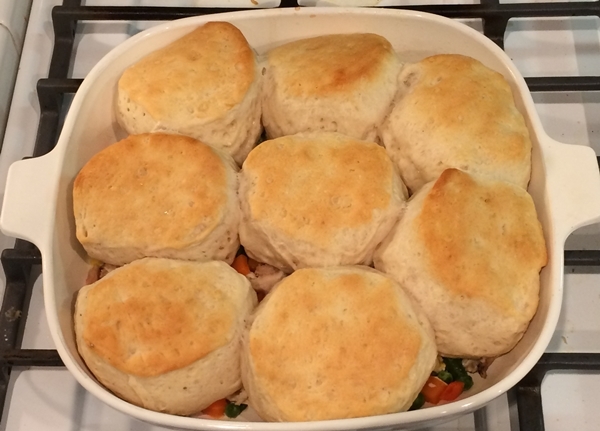 I put everything in a baking dish and topped it with a tube of biscuits from the refrigerated section of the grocery store. 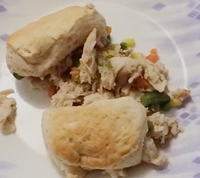 I baked it all in the oven per the instructions on the biscuit package. Talk about a tasty and filling comfort food supper! Terry was more than pleased.